When your opponent activates a Spell/Trap Card, or monster effect, while you control a face-up Attack Position "Infernity" monster and have no cards in your hand: Negate the activation, and if you do, destroy that card. 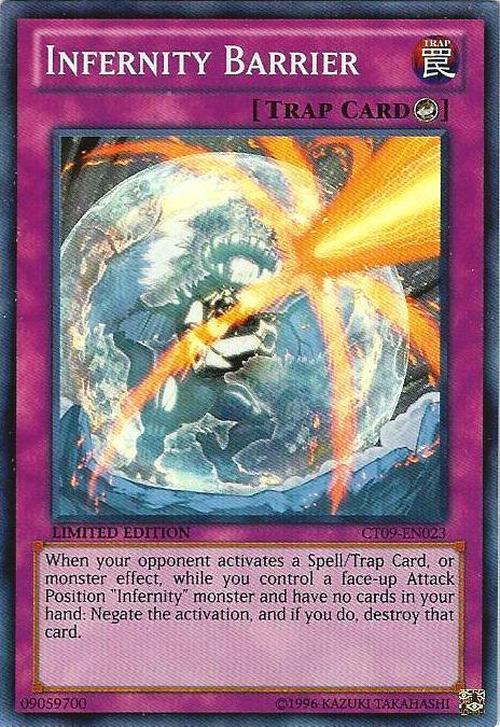 Infernity Doom Dragon appears in this card's artwork. The Italian The Shining Darkness version of this card has an error in its text; it does not say that you need to have no cards in your hand to activate it. The artwork looks similar to Radiant Mirror Force and Storming Mirror Force. This card cannot negate the activation "of the effect" of a Continuous Spell or Trap Card.